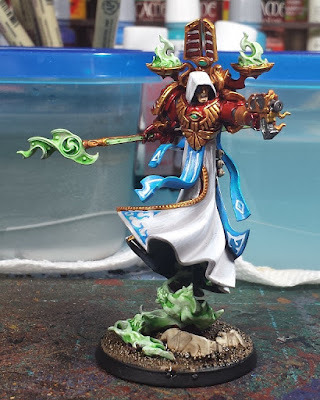 Mordian 7th Regiment: Heresy Era Thousand Sons - Sorcerer Lord Sethep-Khet almost table ready! 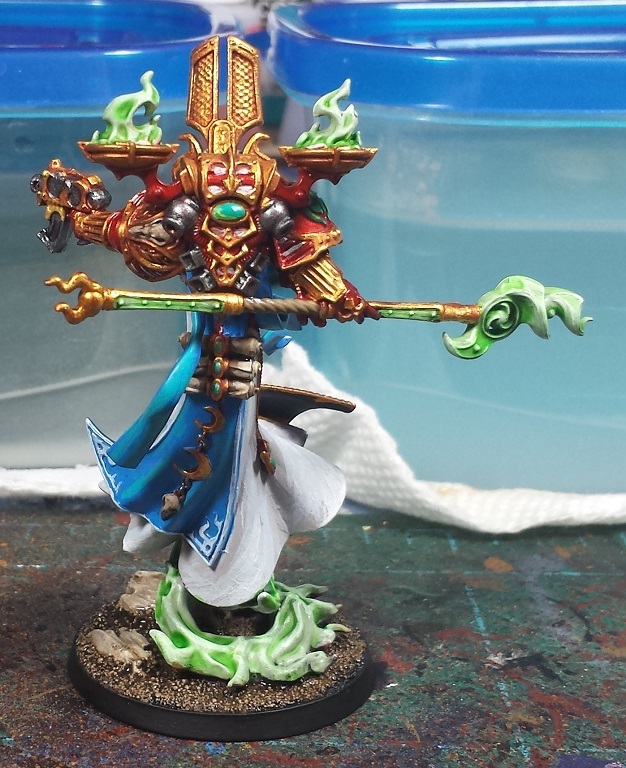 Heresy Era Thousand Sons - Sorcerer Lord Sethep-Khet almost table ready! Picked out a ton of bling, and went with reasonably subdued reversed blue and white detailing on the robes - I think the model is busy enough without over-complicating the paint scheme. Rather pleased with how he's come along! Next up, it's time to reinitialize the painting servitor, and get cracking on with the troops choices - not the most exciting part of the force, but it's good to get them out of the way early! Nice work, the robes look good and the green/white soul fire is awesome! Definitely wouldn't want to get on the wrong side of this guy. Great job! The colour choice is very nice, and the lines of the miniature are great. Love the colours you have going on about this miniature! It really "pops" and looks impressive. Great job! Yeah, that's rather cool looking! @NafNaf: Thanks very much, man! @Bronislaw Czevak: I appreciate it! @stats: Thanks, it has been a fun project to work on! @Phil Curran: Cheers! I usually do heresy audiobooks while batch painting, really helps pass the time! @Jabberjabber: Thanks very much, bud! @Da Masta Cheef: Thanks! Many, many more to come! So, real life got in the way. Catching up missed posts now! Awesome man! .. that's a cool looking model. nice work! I am really looking forward to seeing him amongst his troops, directing them. @Col. Hertford: High praise indeed! I really appreciate it, man! @TJ Atwel: Thanks! Definitely a fun one to build! @Todd Sherman: I appreciate it, thanks! @Rory Priest: First batch of troops on the way! @Joe B: Thanks very much, man! O mate, that is a lovely finished effort. Dynamic posing and painted just right. As Col. Hertford said, you need to send that into GW.